Quebec is home to a good number of mines producing a variety of minerals including gold, iron and copper among others. This is due to the fact that around 90% of the province lies on a substratum of Precambrian rock. This rock is known to have rich mineral deposits, and Quebec is no exception. 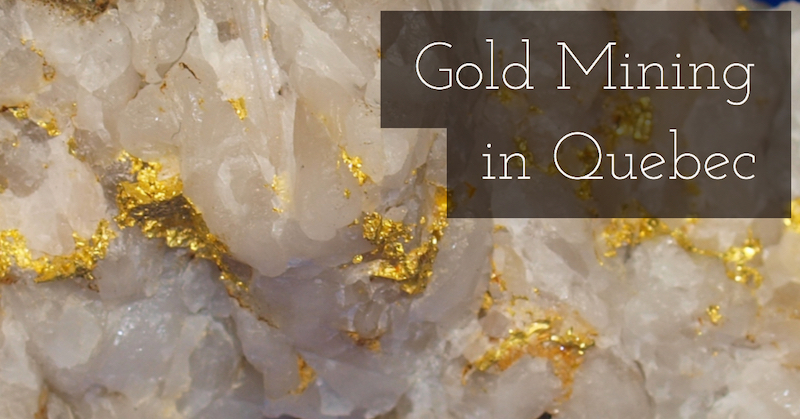 Quebec’s gold deposits are found as both mineral and placer form. That means that recreational miners can successfully find small gold deposits in the rivers and streams in reasonable quantities, and larger mining companies are attracted to the area due to the larger underground reserves. The gold rush in Quebec began earlier that in the rest of Canada. In 1846, a young girl, found a hen egg sized nugget in the Gilbert River which was later named after her. The news of the find spread like wild fire and prospectors flocked the region looking for the next big find. Placer deposits in the area have been quite rich. This is demonstrated by the fact that Quebec is home to the largest nuggets ever found in Canada weighing at 52 and 45 each. Gold exploration in the province, and specifically the Eastern Townships and Beauce lagged behind the rest of the mineral rich region in the country due to issues with property ownership. The regions of Abitibi or Chibougamau which it shares with Ontario, the gold deposits were state property and prospecting was allowed while in the Eastern region of the province, mineral rights were awarded to property owners who received their land under the English Regime. This led to numerous prospecting and mining operations to be abandoned in the area. In 1982, the government took back mineral rights and the area was reopened for staking once more. Since the prospecting and mining operations in these areas had been limited to very few operators, it was re-evaluated in a bid to discover any new deposits. This re-evaluation yielded a lot of success with numerous areas in the region being found to have substantial gold mineralization. This ushered a new era of prospecting and mining that has resulted in the establishment of some successful mines. Another challenge that Quebec has suffered in its quest to exploit the massive gold resources that lie below its substratum is the recent uncertainty of the legal environment when it comes to mining. There was a recent hike in the mining taxes that was implemented without any consultation with industry players. This was a surprise that shook the local mining industry. Recreational gold miners can find some gold in the non-glacial stream deposits around the southern part of Quebec. Miners should look out for gravels that seem to be rusty brown in appearance indicating high iron content. Such gravels are known to have more gold due to the iron sulphide they contain. On the other hand, gravels that have a grey appearance usually hold a lower amount of gold. In these streams you will find flour gold in most cases, but with the history of gold nuggets in the province you can still get lucky and have your name in history like others who were as lucky in the past. Metal detecting may be worthwhile since there is a history of large gold nuggets in Quebec. For the most successful placer gold mining operations, you will need to know where to look. In this case the Chaudiere River is a great place to begin. Any rivers and streams running from the gold rich Abitibi Gold Province that lies partially in Quebec with the other half in Ontario forms another great place to look in. It is always important that you follow the set up regulations by the authorities on panning for gold. It is especially important to observe environmental concerns and appropriate rules and regulations. Quebec is home to 30+ mines producing a variety of minerals. The first minerals to be discovered and mined in the province include asbestos, sulfur, lead, zinc and silver. These were the first minerals to be mined even before viable gold deposits were discovered. Copper, iron and asbestos formed the main mining operations after the Second World War in a period where mining in Quebec hit its highest heights. Today more gold deposits are being found in Quebec with the Northwestern part of the province attracting a lot of attention from mining companies. Deposits in Malartic, a small town in the region reveal over six million ounces underground and over three million ounces in the areas close by. 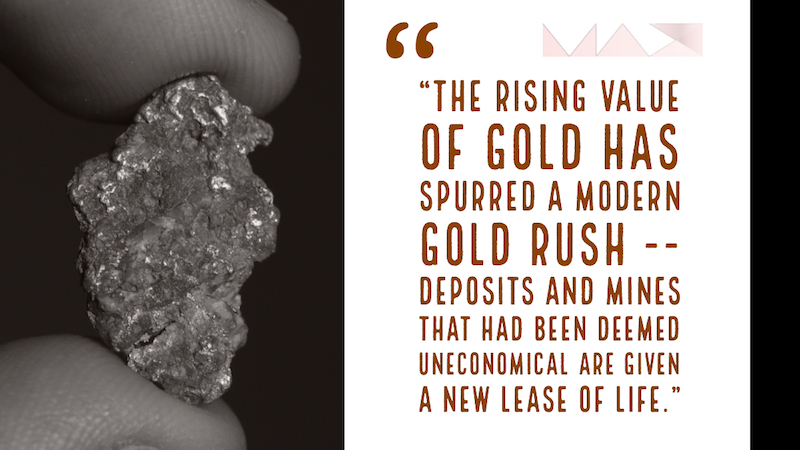 The rising value of gold has spurred a modern gold rush as deposits and mines that had been deemed uneconomical are given a new lease of life.